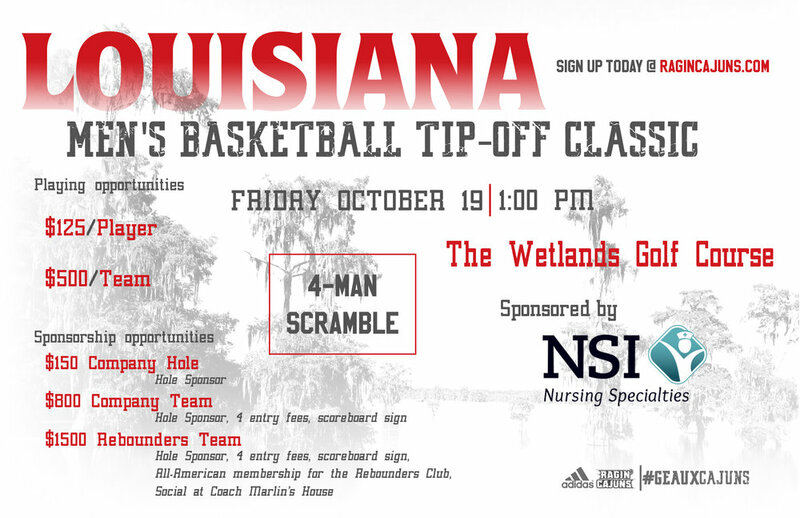 The Louisiana Ragin' Cajuns men's basketball team will host the first-ever "Louisiana Men's Basketball Tip-Off Classic," on October 19 at the Wetlands Golf Course in Lafayette. The four-man scramble, which is sponsored by NSI Nursing Specialties Home Health and Hospice, is scheduled for a 1 p.m. start. Sponsorship opportunities are included for the event, including a company hole ($150), company team ($800) and Rebounder's Team ($1,500). Company hole sponsorships include the companies name and logo on a tee box sign. A company team sponsorship includes a hole sign, four entry fees and a scoreboard sign. The Rebounders Team sponsorship includes a hole sign, four entry fees, scoreboard sign, the All-American package for the Ragin' Cajuns Rebounders Club and a social at head coach Bob Marlin's house. The tournament will feature a silent auction by UL professor, Dr. Brian Campbell. Ragin' Cajuns men's basketball coaches and players will be attending the event. At hole No. 3, Marlin will be helping with your putting game. At hole No. 12, Ragin' Cajuns men's basketball players can help your score with some 3-pointers. Food will be severed at the completion of play. To register, visit www.RaginCajuns.com/tipoff. For more information, contact Kyle Carrigee in the Louisiana Men's Basketball Office at (337) 262-3865 or kcarrigee@louisiana.edu.